SpaceDataHighway will provide high speed laser communication in space of extremely high volumes of data transfer, up to 50 terabytes per day. EDRS-A, the first relay satellite in the SpaceDataHighway programme (also called EDRS), will be launched to geostationary orbit on 28 January 2016 (Baikonour time). The SpaceDataHighway will provide high speed laser communications in space of up to 1.8 Gigabit per second. This major programme, which cost nearly €500M to develop, is the result of a public-private partnership (PPP) between the European Space Agency (ESA) and Airbus Defence and Space. Using communication relay satellites such as EDRS-A, the SpaceDataHighway will be able to transfer high volume information (images, video, data collected by sensors) from Earth observation satellites, UAVs and surveillance aircraft, or even from a space station such as the ISS. Thanks to the very high communication rates possible with laser (up to 1.8 Gbit/s) and the geostationary orbit positioning of the relay satellites, up to 50 terabytes per day can be transmitted securely in near-real-time to Earth, as opposed to the often 3 to 4 hour delay currently experienced. “SpaceDataHighway is the equivalent of optical fibre in Space. It will revolutionise satellite and drone communications, and help to keep the European space industry at the forefront of technology and innovative services,” said Evert Dudok, Head of the Communications, Intelligence & Security (CIS) business at Airbus Defence and Space. As lead contractor of the EDRS-SpaceDataHighway PPP, Airbus Defence and Space is cofinancing, owning, manufacturing and operating the system as well as commercialising it. The German national aeronautics and space research centre (DLR) is also participating in financing the system and also in the development and operation of the ground segment. Thirteen European countries are involved in the consortium. The first communication node of the SpaceDataHighway system, called EDRS-A, is a payload carried on Eutelsat 9B, a Eurostar E3000 type satellite built by Airbus Defence and Space and to be operated by Eutelsat. 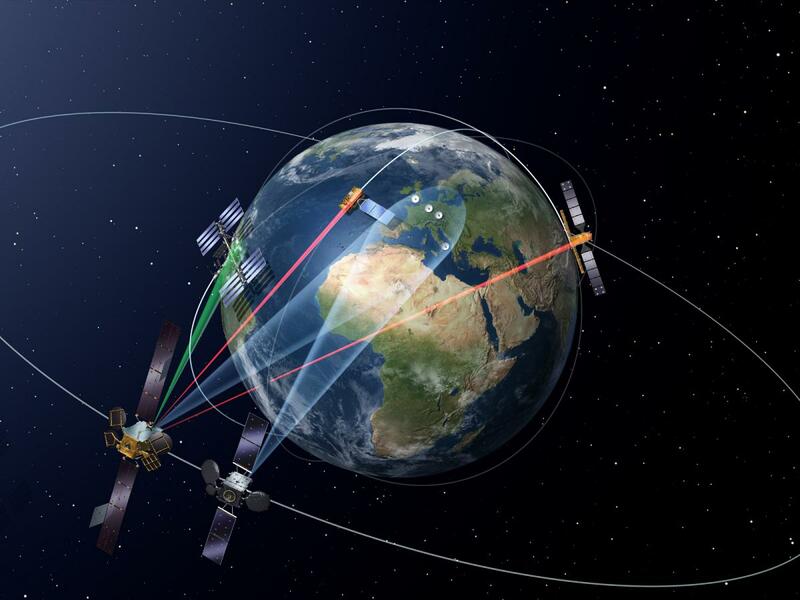 The main component of the EDRS payload is the Laser Communication Terminal (LCT) built by Tesat Spacecom, a subsidiary of Airbus Defence and Space. Within the next few days, Eutelsat 9B will be sent into orbit from Baikonur on a Proton launcher and will be positioned over Europe at 9° East. This orbital position will enable EDRS-A to establish laser links with orbiting observation satellites and UAVs positioned over Europe, Africa, Latin America, the Middle East and the North-East coast of America. A second satellite dedicated to the SpaceDataHighway system, EDRS-C, will be launched in 2017. This second satellite will guarantee redundancy and extend the coverage. Airbus Defence and Space and ESA are aiming to expand the capacity and provide global coverage of the system by 2020, with a third node to be positioned over the Asia-Pacific region. Using the four Sentinel-1 and Sentinel-2 satellites of Copernicus, the European Earth observation programme, the European Commission will be the first customer of the SpaceDataHighway system. These four observation satellites are equipped with laser communication terminals which will significantly accelerate the delivery of time-critical data and large volumes of data to Earth monitoring centres. In case of crisis or natural disaster management, up-to-date information is crucial for the authorities to prepare the most appropriate emergency response.